All dogs shed. Shedding (or blowing) the coat is a natural cycle in every dogs life. The term 'non-shedding' is a misconception and the idea that there's a cure for shedding is a falsehood. The difference in how much each dog sheds is based on what happens to the coat they drop. A lab, or shepherds outer or guard coat does not trap the shedding fur that falls out on the furniture, clothes, etc. A poodles coat, however, traps the shedding fur rather than dropping it all over the house. That dead coat is the main cause of matting. When brushing, you are getting out the dead coat that has shed and not been released onto the carpet. Shedding is seasonal, usually occurring every spring and fall and related primarily to changes in the duration and intensity of sunlight. House dogs are exposed to long hours of artificial light and it sometimes seems as if they never quit shedding. Most dogs shed at least once a year (though some breeds shed more frequently) and do not shed their coats evenly. Some have a double coat composed of a long outer coat of guard fur and an undercoat of softer shorter fur. When a dog with this type of coat begins to shed, the inner coat may come out in a patchy fashion and your dog may look quite moth-eaten! Coat loss is occasionally precipitated by factors other than light and seasonal changes. For dogs, the last area in which their bodies will expend energy is for the maintenance of a thick, luxurious coat of fur. Other things are simply more important for the health and survival of the animal. Therefore, if a dog is on a poor quality of food (for example), it will use all the energy derived to maintain bodily functions and let the quality of its coat slide. Poor coat quality is also frequently seen in an older animal whose digestive system isn't working as well as it used to. The same is true for dogs that have been sick or stressed. Stressful conditions typically cause fur to drop out first on the body and flanks, where fur grows the fastest. In some cases patchy fur growth can also signal an underlying medical condition (i.e. thyroid problems) and you should consult your veterinarian. Anyone who raises many puppies has noticed that the mother will blow her coat when the puppies are five to twelve weeks old. She will shed fur faster than she has at any other time in her life but, thankfully, in another three months it will probably be back to normal. The same is seen in female dogs after a normal heat cycle where no breeding has occurred. The main factor affecting these females coats is the hormone estrogen. Estrogen causes the fur to drop earlier than it normally would. Any dog that has been under anesthesia for 45 minutes or more will blow their coat within seven to twelve weeks. In some dogs it may only be seen as an increase in the normal shedding, but most dogs will lose quite a bit of their coat. The veterinarian community doesn't know for sure, but attribute this to a stress response. Anytime a dog is stressed, in poor state of nutrition, or following the effect of anesthesia or certain hormones, expect the skin and coat to suffer. All of these are reversible and the coat will return to normal after the animal has returned to good health and/or the effects of the substance causing this have passed. How severely the dog is affected and how soon the effects are reversed varies with different individuals and breeds. If the coat does not seem to be returning to normal, or there is no discernable reason for the fur loss, the dog should be taken to its vet for testing. As always, Pawsh Styling is here to assist you in caring for your pet. 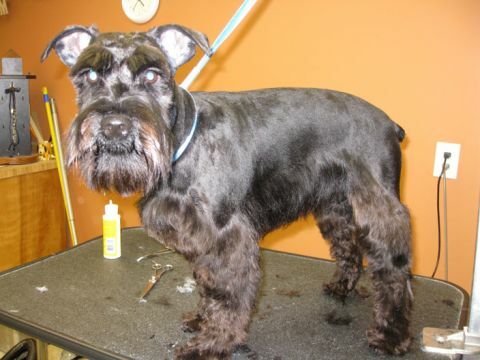 We are willing to discuss pet concerns with you and advise you on topics related to your dogs health and grooming.